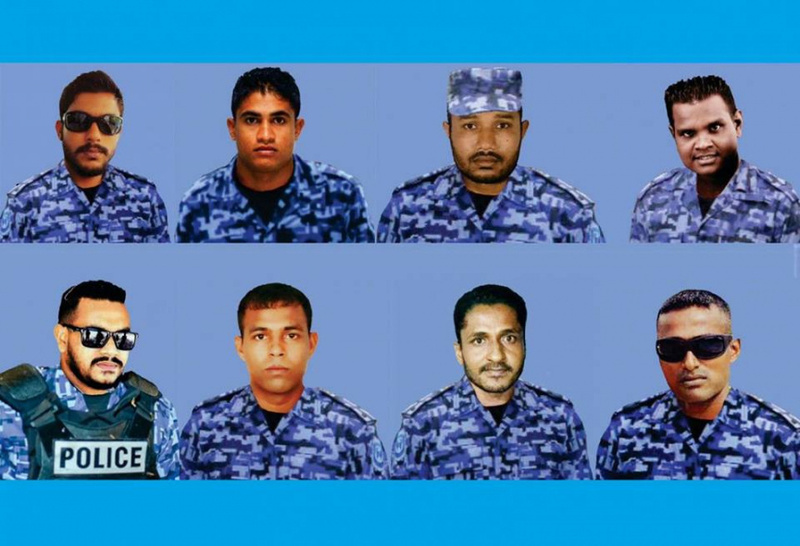 Combined file photos of the eight former police officers arrested for suspected complicity in an attempt to overthrow President Abdulla Yameen Abdul Gayoom's administration. The former police officers arrested during the recent State of Emergency in Maldives have all been transferred to house arrest. The officers were transferred to house arrest, where they will remain pending the outcome of their trial, by Criminal Court last Tuesday. The former police officers were arrested for suspected complicity in an attempt to overthrow incumbent President Abdulla Yameen Abdul Gayoom. They were dismissed from the Maldives Police Service following their arrest. The Criminal Court granted house arrest for the eight ex-officers for 30 days, upon which they will be presented to the court again for an extension to their house arrest. In addition to being charged with attempt to illegally overthrow the legitimate government of Maldives, the former officers have also been charged with joining forced with another group of individuals in an attempt to illegally overthrow the legitimate government of the country, confronting and physically assaulting security forces during an illegal gathering and attempting to create distrust regarding security forces among the general population.